Liner notes and Cover art included. 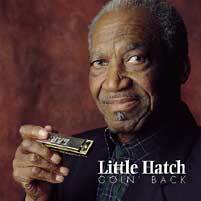 Pull up a porch chair, lean it back on two legs and enjoy the music of Kansas City blues legend Little Hatch on Goin Back. They love the little man in Kansas City - where the traditional blues harmonica player's birthday has been proclaimed Little Hatch Day in honor of his broad fan support - and you'll love the sound that has been lighting up the KC nightclub sky and other venues for years. APO owner Chad Kassem first heard the harmonica player in the early 1980s at the Grand Emporium in Kansas City - when Kassem was still flipping burgers and not even thinking about the music business - and was amazed at how few recordings Little Hatch had made (one at the time, The Little Hatchet LP in 1972). Little Hatch (who was once nicknamed Little Walter Jr. but changed it becuase his music deserved a name of its own), made this unplanned and unrehearsed recording for Kassem's APO label at Blue Heaven Studios when Hatch found himself as a spectator during another recording session. He couldn't help himself and cut loose while the tape rolled along with the masterful guitar accompaniment of longtime associate Bill Dye. In about three hours, Little Hatch completed 15 cuts, most on the first take. The result was traditional, raw, dirty blues at its finest with hamonica and slide guitar. The acoustics of the grand old church make it sound like Little Hatch is, indeed, playing just for you on your back porch or in your living room. So go on back to the porch. Pull up that chair and take a listen. You won't believe two people can create such great blues. Recorded like they're in your living room. Highly recommended.